The Palm Deira is an artificial archipelago a part of the Palm Trilogy. 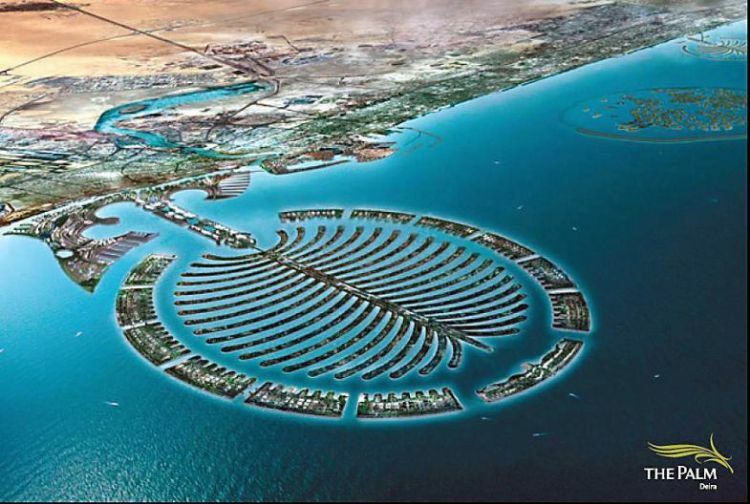 Originally it was announced in October 2004 with the plan of developing it 8 times larger than Palm Jumeirah and 5 times larger than Palm Jebel Ali. It was intended to house one million people and was about cover an area of 14 by 8.5 kilometres with 41 fronds. But due to substantial changes that took place in Persian Gulf the design was redone and it was cut down to 12.5 by 7.5 kilometres with development of 18 fronds. It was modified in the year 2007. It is located alongside Deira. It offers a unique array of exciting investments opportunities on the Trunk and the Croniche. It will further enhance the value of Deira and will be developed on this iconic manmade island. It will rekindle and revitalize the old area of Deira that has lost its attraction due to the new construction popped in the city. The construction of Palm Deira is going on in phases, due to its large size. It will be a mix use project that will comprise of Residential which will include luxuries residential apartments, Commercial which will include business and trade complex and finally recreational area that will include shopping mall, resorts and hotels. The district of Palm Deira is brings in some of the very impressive property project which includes 2 storey townhouses, three different types of Villas Premier, Grand &amp; Vista, Homes of Fronds and Luxurious beach side hotels, cafes and restaurants.